Enhance your advertising using Full Colour Glossy leaflets. 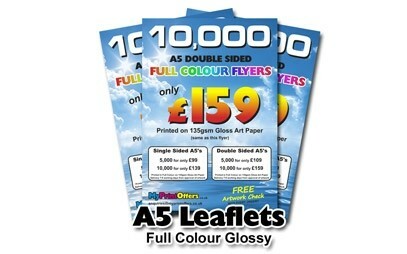 We offer the most popular sizes of leaflet which are printed in full colour on 135gsm Gloss. You can choose from single sided or double sided leaflets in quantites of 5,000 or 10,000. Artwork and Design is available for a small extra charge and a FREE 'Print Ready' artwork check is available for customers who supply their own artwork. Please see our website for more details. Other sizes and quantites are available on request. Our Luxury business cards are a standard size of 85mm x 55mm and are Litho printed in Full Colour onto 400GSM Silk Board and Matt Laminated for a luxurious look and feel. Artwork and Design is available for a small extra charge and a FREE 'Print Ready' artwork check is available for customers who supply their own artwork. Please see our website for more details. 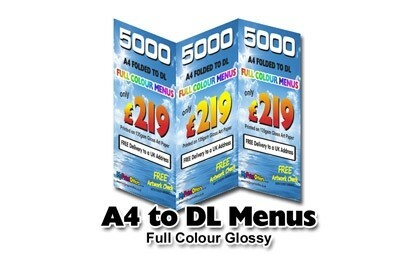 We offer full colour glossy A4 menus printed on 135GSM gloss art paper which are folded to A5 or to DL as required. Artwork and Design is available for a small extra charge and a FREE 'Print Ready' artwork check is available for customers who supply their own artwork. Please see our website for more details. 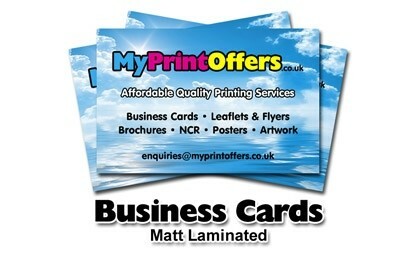 We offer an Artwork & Design service for our customers for business cards, leaflets, menus etc. Charges vary depending on the printing product being ordered. We give FREE 'Print Ready' artwork checks to all customers who submit their own artwork, and templates are Freely downloadable from our website to help with design and layout.